This game is similar to "Go Fish". 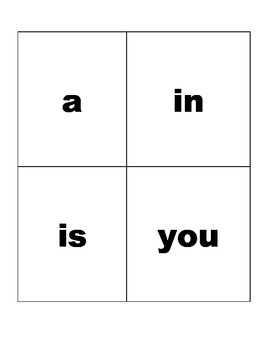 The teacher will need to print out the cards on card stock or laminate the cards. Students can play in groups of 2-6. A turn consists of asking a specific player for a specific word. 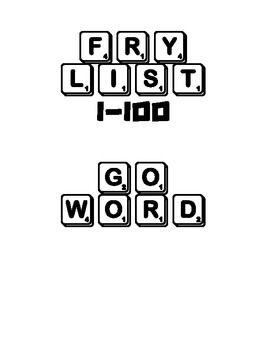 If this player has the specific word they will give it to the player that asks and form a match on the table or floor where they are playing. 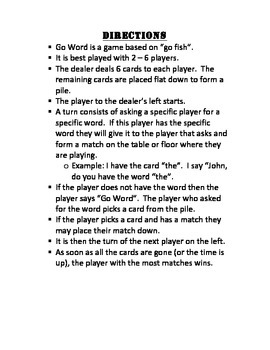 If the player does not have the word then the player says “Go Word”. The player who asked for the word picks a card from the pile. If the player picks a card and has a match they may place their match down. It is then the turn of the next player on the left. As soon as all the cards are gone (or the time is up), the player with the most matches wins.